Xanthan gum is a polysaccharide comprising of Glucose, Mannose and Glucuronic acid molecules. In food industry, Xanthan gum is commonly used as food additive, food thickening agent and a food stabilizer. Xanthan gum can be derived from the variety of sources such as Corn, Wheat & Soy. The greater the weight ratio of Xanthan gum added, the thicker the liquid will become. In general 0.2% by weight of Xanthan gum is added and too much of xanthan gum can result in an unpleasant and undesirable slimy texture. Xanthan gum is effectively stable in a wide range of viscosities, temperatures, and pH levels. Xanthan gum is produced by fermentation of Glucose, Sucrose and Lactose. In the fermentation process the polysaccharide is precipitated from a growth medium with isopropyl alcohol and ground into a fine powder. Fine powder medium is added to a liquid medium to form the gum. 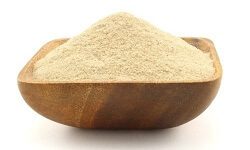 Xanthan gum is produced industrially by inoculating a sterile aqueous solution of carbohydrate(s), a source of nitrogen, dipotassium phosphate, and some trace elements. After the fermentation process, the polymer is precipitated from the medium by the addition of Isopropyl alcohol. Xanthan gum is widely used as food additives in the food industry. It is used as a thickener to maintain the viscosity in pastry fillings and prevents the water seeping out and soaking the dough, thus protecting the crispness of the crust. Xanthan gum is used in ice creams as well to prevent the formation of ice crystals. It is mainly used in ice creams to maintain the pleasant texture. Xanthan gum is used in most of frozen foods and beverages. It is also used in the egg substitutes made from egg whites, to replace the fat and emulsifiers found in yolks. It is even used in food applications such as salad dressings, sauces, instant products, desserts, bakery dairy products, and fruit juices as well as in the formation of various low-calorie foods.